Melanoma accounts for 4% of incident cancers and its mortality rate is increasing. Surgical excision remains the treatment of choice for early disease, and adjuvant therapy with interferon alfa has shown benefit in some stage II and III cases. However, advanced melanoma is an aggressive disease for which there are few therapies, and which portends a poor prognosis. The US Food and Drug Administration (FDA) previously approved interleukin-2 and dacarbazine in this setting; in clinical trials, each had response rates of 10-20% and neither showed an overall survival benefit. [3, 4] More recently, ipilimumab (Yervoy), a fully humanized antibody that binds to cytotoxic T-lymphocyte-associated antigen 4 (CTLA-4) and sustains an immune attack on neoplastic cells, was approved by the FDA for use in the metastatic setting. Approval was based on a randomized study showing that ipilimumab improved survival from 6 months to 10 months compared with an experimental vaccine. This advance promised new effective treatment for what was once a treatment-refractory disease and more research is underway to investigate other molecular pathways that may be targeted in an effort to produce further significant results. One potential advance that showed a lot of promise in the preclinical, and now in the clinical setting, is the targeting of the BRAF kinase in melanoma. Vemurafenib and dabrafenib are BRAF kinase inhibitors available in the United States. Trametinib, a mitogen-activated extracellular signal regulated kinase (MEK) inhibitor, is also FDA-approved. The mitogen-activated protein (MAP) kinase pathway is an important driver in melanoma and is made up of several potential targets providing therapeutic options. 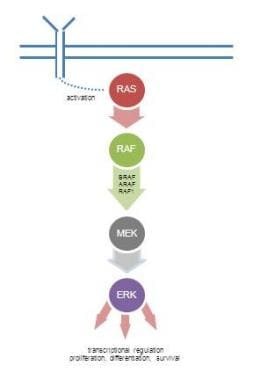 In this pathway, the activation of RAS proteins stimulates the RAF kinases ARAF, BRAF, and RAF1. This process causes the phosphorylation of the MEK kinases, which phosphorylate the ERK kinases. Activated ERK regulates cyclin D1, which, in turn, regulates multiple cellular processes involved in cell division (see Figure). Figure. The mitogen-activated protein (MAP) kinase pathway. Approximately 40-60% of melanomas contain a mutation in the gene that encodes BRAF that leads to constitutive activation of downstream signaling in the MAP kinase pathway. In 80-90% of these cases, the activating mutation consists of the substitution of glutamic acid for valine at amino acid 600 (V600E). [7, 8] In a series of 197 patients, Long and colleagues showed that BRAF mutations were associated with a features of high-risk melanoma, including truncal primary, earlier age ofonset, lack of chronic skin damage, and shortened survival,  suggesting the value of inhibiting mutated BRAF. First-line treatment of patients with BRAF V600 wild-type or mutation-positive, unresectable or metastatic melanoma is with nivolumab as a monotherapy or in combination with the immunotherapy ipilimumab. The FDA approved the combination regimen of nivolumab plus ipilimumab on September 30, 2015 in previously untreated patients with BRAF V600 wild-type unresectable or metastatic melanoma. Approval was based on results from the phase 2 CheckMate-069 study Of the 142 patients enrolled, 109 had both BRAF wild-type and BRAF mutation-positive melanoma. The primary endpoint was objective response rate (ORR) in patients. In patients with BRAF wild-type melanoma treated with the combination regimen, the overall response rate was 61% (95% CI: 48-71) compared to 11% (95% CI: 3-25) in patients given ipilimumab monotherapy (P <0.001). Following on these results, the BRAF Inhibitor in Melanoma (BRIM)-3 phase 3 trial randomly assigned 675 patients to vemurafenib or dacarbazine 1000 mg/m2 every 3 weeks. In January 2011, investigators reported that the trial had closed early due to meeting its overall survival and progression-free survival endpoints, and that patients randomized to dacarbazine would be able to cross over upon progression. Final data from BRIM-3 were presented at the American Society of Clinical Oncology meeting in June 2011 and simultaneously published in The New England Journal of Medicine. Vemurafenib was associated with a 63% relative risk reduction for death and a 74% risk reduction for disease progression or death; the response rate with vemurafenib was 48% vs only 5% with dacarbazine. At 6 months, 84% of patients who had been given vemurafenib were still alive vs only 64% of those who received dacarbazine. Of note, the median time to response to vemurafenibwas1.45months,andthemedianprogression-free survival 5.3 months. Sorafenib is a tyrosine kinase inhibitor that blocks wild-type BRAF but not the V600E mutated oncogenic BRAF. A phase 3 trial of sorafenib combined with carboplatin and paclitaxel failed to show an impressive response rate. It is thought that this is due to the fact that sorafenib alone does not inhibit the V600E mutated BRAF and that BRAF is only the major driver in melanoma when it is mutated. It remains to be seen whether sorafenib in combination with other targeted agents in melanoma could overcome treatment resistance. It is as yet unknown how vemurafenib or other BRAF inhibitors might be most effectively incorporated into the clinic. Data from the phase 3 trial of vemurafenib indicate that the drug has a rapid onset of response but a short duration of response; thus, the drug might be best suited for patients with rapidly progressing and/or symptomatic disease. By contrast, patients with asymptomatic and/or slowly progressing disease could be considered first for ipilimumab in an attempt to elicit an immune response and then be switched to vemurafenib upon signs of progression. Note that there are no data yet on sequencing ipilimumab and vemurafenib so it is unknown whether the use of ipilimumab might affect response to vemurafenib. If one were to follow this approach, patients with localized disease who are considered at “high risk” for metastasis should be tested for BRAF mutations so that the information would available if there is a need to initiate vemurafenib immediately. The definition of “high risk” in this setting is variable, and could include patients with stage IIB disease or higher, signs of ulceration, positive lymph nodes, larger tumors, etc. For patients with newly diagnosed, rapidly progressing metastatic melanoma, a BRAF mutation analysis should be done immediately. The cobas® 4800 BRAF V600 Mutation Test detects the mutation in formalin-fixed, paraffin-embedded tissue. Although the manufacturer states that the test can be performed in fewer than 8 hours from receipt of the specimen, physicians in private practice who do not routinely process specimens for genetic testing might find that waiting for a positive or negative test result might constitute an unacceptable delay in treatment initiation. It would be considered off-label use to start treatment immediately while waiting for test results and then discontinuing if the test results show that a mutation is not present. Whether this practice will nevertheless gain traction in the community remains to be seen. Ultimately, as more studies are conducted with this class of agents, the community will hopefully come to a consensus on how best to incorporate BRAF mutation testing into clinical practice. Jemal A, Siegel R, Xu J, Ward E. Cancer statistics, 2010. CA Cancer J Clin. 2010 Sep-Oct. 60(5):277-300. [Medline]. Carbone PP, Costello W. Eastern Cooperative Oncology Group studies with DTIC (NSC-45388). Cancer Treat Rep. 1976 Feb. 60(2):193-8. [Medline]. Atkins MB, Lotze MT, Dutcher JP, Fisher RI, Weiss G, Margolin K, et al. High-dose recombinant interleukin 2 therapy for patients with metastatic melanoma: analysis of 270 patients treated between 1985 and 1993. J Clin Oncol. 1999 Jul. 17(7):2105-16. [Medline]. Wellbrock C, Hurlstone A. BRAF as therapeutic target in melanoma. Biochem Pharmacol. 2010 Sep 1. 80(5):561-7. [Medline]. Solit DB, Rosen N. Resistance to BRAF inhibition in melanomas. N Engl J Med. 2011 Feb 24. 364(8):772-4. [Medline]. Huang T, Zhuge J, Zhang WW. Sensitive detection of BRAF V600E mutation by Amplification Refractory Mutation System (ARMS)-PCR. Biomark Res. 2013 Jan 16. 1(1):3. [Medline]. Long GV, Menzies AM, Nagrial AM, Haydu LE, Hamilton AL, Mann GJ, et al. Prognostic and clinicopathologic associations of oncogenic BRAF in metastatic melanoma. J Clin Oncol. 2011 Apr 1. 29(10):1239-46. [Medline]. Fennira F, Pagès C, Schneider P, Sidina I, Viguier M, Basset-Seguin N, et al. Vemurafenib in the French temporary authorization for use metastatic melanoma cohort: a single-centre trial. Melanoma Res. 2013 Nov 14. [Medline]. Ribas A, Kim KB, Schuchter LM, et al. BRIM-2: an open-label, multicenter phase II study of vemurafenib in previously treated patients with BRAFV600E mutation positive melanoma. J Clin Oncol. 2011. 29(suppl):Abstract 8509. Chapman PB, Hauschild A, Robert C, Haanen JB, Ascierto P, Larkin J. Improved survival with vemurafenib in melanoma with BRAF V600E mutation. N Engl J Med. 2011 Jun 30. 364(26):2507-16. [Medline]. Dooley AJ, Gupta A, Middleton MR. Ongoing Response in BRAF V600E-Mutant Melanoma After Cessation of Intermittent Vemurafenib Therapy: A Case Report. Target Oncol. 2016 Feb 9. [Medline]. Jain T, Bryce A. Intermittent BRAF Inhibition Can Achieve Prolonged Disease Control in BRAF Mutant Melanoma. Cureus. 2015 Dec 16. 7 (12):e410. [Medline]. Al-Marrawi MY, Saroya BS, Brennan MC, Yang Z, Dykes TM, El-Deiry WS. Off-label use of cetuximab plus sorafenib and panitumumab plus regorafenib to personalize therapy for a patient with V600E BRAF-mutant metastatic colon cancer. Cancer Biol Ther. 2013 Aug. 14(8):703-10. [Medline]. Kefford R, Arkenau H, Brown MP, et al. Phase I/II study of GSK2118436, a selective inhibitor of oncogenic mutant BRAF kinase, in patients with metastatic melanoma and other solid tumors (abstract 8503). J Clin Oncol. 2010. 28(suppl):15s. Flaherty KT, Lee SJ, Schuchter LM, et al. Final results of E2603: a double-blind, randomized phase III trial comparing carboplatin/paclitaxel with or without sorafenib in metastatic melanoma (abstract 8511). J Clin Oncol. 2010. 28(suppl):15s. Long GV, Stroyakovskiy D, Gogas H, et al. Dabrafenib and trametinib versus dabrafenib and placebo for Val600 BRAF-mutant melanoma: a multicentre, double-blind, phase 3 randomised controlled trial. Lancet. 2015 Aug 1. 386 (9992):444-51. [Medline]. Addeo A, Rinaldi CR. Treatment with ipilimumab: a case report of complete response in a metastatic malignant melanoma patient. Case Rep Oncol. 2013 May. 6(2):285-8. [Medline]. [Full Text]. Spain L, Larkin J. Combination immune checkpoint blockade with ipilimumab and nivolumab in the management of advanced melanoma. Expert Opin Biol Ther. 2016 Feb 1. 1-8. [Medline]. Larkin J, Chiarion-Sileni V, Gonzalez R, et al. Combined Nivolumab and Ipilimumab or Monotherapy in Untreated Melanoma. N Engl J Med. 2015 Jul 2. 373 (1):23-34. [Medline]. Disclosure: Received research grant from: Amgen; Caris Life Sciences<br/>Received income in an amount equal to or greater than $250 from: Bristol-Myers Squibb; Amgen; Astra-Zeneca; Genentech.